The Bulldog was named by Mike Malone and Scott in the early 90s after Scott returned from Australia with 36 of Jerry‘s frames. The frames were all cast in Australia for Jerry through Australian tattooer Des Connolly. The Bulldog frame was the second of three frames cast by Sailor Jerry. In the early 90s at China Sea, Scott had the frames milled in 2 different styles, the first was a long geometry frame with a front loader tube-vice like Jerry intended. Scott believes that shortly after Jerry had these milled he realized that the frame geometry had two great a distance between the back up-right and the tube-vice hole. Jerry solved this problem by cutting off the vice and putting a bottom on it to rectify the geometry problem and making the frame more compact. Scott came to understand this on the second batch he milled. The machines built in the 90s using these frames cast in Australia are now selling for upwards of $3000. Scott never particularly cared for the longer geometry frame and was fonder of Jerry’s front loader tube vice. The Sailor Jerry Bulldog available here has a shorter frame with Jerry‘s original style vice which makes for an ideal configuration. On the bulldog liner the Front upright is repositioned to make a faster running liner for smaller groupings while using a longer armature bar on the machine to push larger groupings. This makes a more versatile liner that can handle any needle groupings depending on the power adjustment and your individual style and technique. The original Bulldog shader frame was modified by Paul Rogers who straightened the upright in order to shorten the geometry of the frame. Paul took the same frame and bent it back to create a faster running liner, which Scott has used as inspiration for this machine. The tube vice used is the original style that Jerry intended. These machines have a front loader vice with a pinch bolt between the tube hole and the front coil. As far as Scott knows Jerry was the first one to have done a tube vice in this fashion. The frames for the Bulldog Shader and Liner are milled on a CNC machine, which has the closest tolerances of any method of frame manufacturing design. Both frames are milled from a solid block of billet 1018 steel for strength and magnetic conductivity. Like all of Scotts machines they are made of the highest quality parts including a silver contact screw and contact point. The coils are hand wrapped. A share of the proceeds will be distributed to Sailor Jerry Collins Family. "As I continue to learn more about tattoo machines I feel that this is the best frame design I have made so far. I also feel that I am making the most consistent machines in my 37 years of machine building." 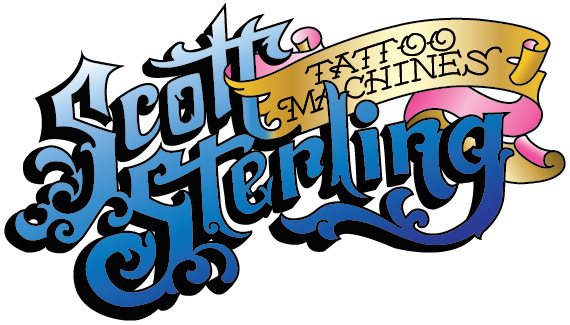 Each Sterling tattoo machine is run for 2 or 3 days to break it in and personally used to tattoo on various body parts to ensure his highest level of quality. **For international shipping rates please contact us.